Some might call the thong part of the national dress of Australia, when you think about some of the icons of our country the thong image is always there. This project might be part of Australian studies and become an exercise in fashion design. It would make a pretty impressive display celebrating the arrival of summer. 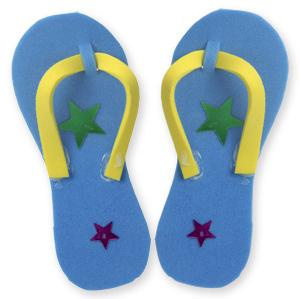 Draw and cut a sole shape out of Craft Fun Foam for the thong. Cut a thin strip of another coloured Craft Fun Foam. Make two small slits in the sole to slide the thin strip through for the toe hold. Thread the thin strip through to the mid point of the strip and glue the two ends down on either side of the sole. Decorate the thong with Sequins etc.